Lat 9° 7' 60S Long 159° 49' 0E Savo Island is a circular shaped volcanic island in Iron Bottom Sound between Guadalcanal to the south and Florida Island (Nggela Sule, Big Gela) to the northeast and Tulagi Island to the east. 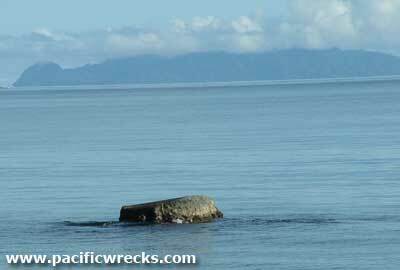 From the north coast of Guadalcanal, Savo Island is visible from nearly every point and has the appearance of the profile of a person lying down. Although no fighting occurred on Savo Island, the surrounding area was the focal point of many Naval battles of the Guadalcanal campaign including: Battle of Savo Island (August 9, 1942), Battle of Cape Esperance (October 11–12, 1942) Naval Battle of Guadalcanal (November 13, 1942), Second Naval Battle of Guadalcanal (November 14-15, 1942), Battle of Tassafaronga (November 30, 1942) and Operation Ke (February 1943). After the battles, oil and debris washed ashore. During 1943 after the Guadalcanal campaign, the Americans built anti-aircraft emplacements in bunkers on Savo Island.